columbus xcr is a seamless high grade stainless steel tubing set that is cold drawn from a sold billet of metal. the thickness can be as little as 0.4mm offering excellent weldability and is highly corrosion resistant. this latter fact pretty much explains why milani chose to paint only a portion of their acciaio puro in a not altogether attractive black and yellow scheme that covers the rearmost portion of columbus' flagship steel. 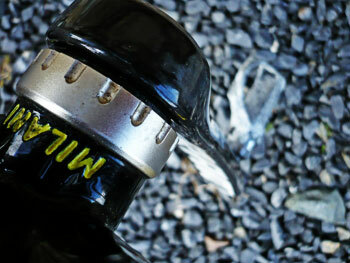 it is reminiscent of those chromed bmx bicycles that used to decorate many a bikeshop around ten or fifteen years ago. not that inspiring to be honest. several builders have utilised xcr in framesets, and others have gone for reynolds 953, but most, as indeed have milani, chosen to tig weld rather than opt for lugged construction (there is an xcr tube set available for those who do) i have no real idea whether the stainless bit is a by-product of creating a high quality steel, or whether the shiny surface was in the plan from the beginning, but from a purely aesthetic point of view, i'd be happier if the shine were concealed under a few coats of paint. the model sent for review featured carbon forks painted to match the acciaio's partial paint scheme, sliding into a 1.125" head tube. while the object of the exercise was to review the frame, in order to do so, a variety of components were required to turn it into a bicycle. the fork steerer was held in place by a rather desultory looking pro headset on which there was little danger of form outshining function. tecno tubo torino (3t) provided both 130mm alloy stem and ergosum bars, the latter with added bright yellow comfort by way of cork style bar tape. 3t also supplied a twin bolt carbon seatpost, atop which sat a san marco regal super leggera saddle with rather cool looking matt carbon rails. braking and shifting was provided by sram force: calipers, double tap carbon levers, front and rear mechs and standard 53/39 carbon chainset. the single biggest factor governing ride quality after the frame is by way of the wheelset, in this case a pair of ambrosio black star hubs, married to deep flange carbon circles and aluminium braking surfaces. tyres were vredestein fortezza clinchers. 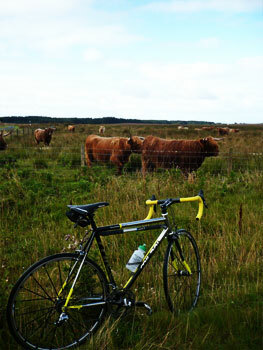 sadly, i never got as far as riding these for any consummate distance. the bicycle was delivered in its enormous cardboard box at 4:30pm on friday afternoon. i'd agreed to accompany a local rider on his first century ride for charity on saturday, which seemed like the ideal opportunity to review the milani under extenuating circumstances. at 8am the following morning, i rolled down bowmore main street to meet up for the start at bowmore distillery, to find no-one there. figuring we might be starting from the guy's house, i did an about turn, and started back up the hill. 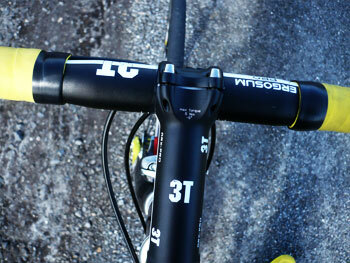 after only a few hundred metres, the rear wheel pulled forward and jammed against the left chainstay. unable to unclip quickly enough (mostly because i couldn't quite figure out what had happened), i went over sideways giving my shoulder an uncomfortable bash. 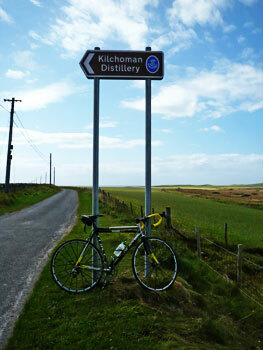 in the process, the saddle had loosened on its rails, so rather than spend my early morning footering in the middle of bowmore main street, i hurriedly wheeled the bike home and switched to the cielo. on return from my hundred miles, i checked the rear wheel, tightened the skewer almost to breaking point, and tightened the saddle bolts. the following morning, not wishing to be caught out twice, i climbed aboard, held onto a wall and gave a substantial kick to the pedals. 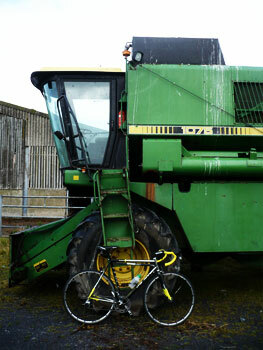 the wheel pulled out yet again, so it was left in the shed, and i went out on the colnago master instead. closer examination showed the non-drive locknut on the hub to be perfectly smooth rather than serrated, and of narrow cross section. i tried the wheels with a pair of titanium skewers cranked up unbelievably tight with the same end result. it seems the locknut was serially failing to bind on the stainless dropout. i replaced the supplied wheels with a pair of mavic ksyriums which cured the problem immediately. i have no idea how anyone else has faired aboard the ambrosios, but to me it seems like a design fault. the wheels remained in the box. with a working pair of wheels fitted, and two missed opportunities for a lengthy bike ride, the shiny tubing and i finally headed into the hinterlands to find out just what i'd been missing all those days. though the phrase steel is real is one oft bandied about, in my less than considerable experience, there is a great deal of difference between one end of the market and the other. for though the cycle industry has had many a long year to gain experience in building with this worthiest of materials, not all of them have managed to get it right. a traditionalist at heart, i still prefer the look and feel of tubes and lugs, aware though i am that such was practised simply due to there being no other practical way to join tubes at the time. the columbus xcr tubing on the milani is tig welded (very neatly i might add); it does detract from the aesthetic, but i can promise you it removes not one iota of joy from the ride. not given to making comparisons if i can help it, i may have to break my own preference here and state that it rides more like titanium than steel. i have two other steel bikes in the twmp bikeshed, one of which is steel from top to toe, including the forks, and the other possessing a carbon rear end. the acciaio puro rides like neither, so much so, that i had to check milani's website to discover at what type of rider the bike was aimed at. despite angles and intent aimed squarely at the competitive cyclist, the comfort and joy imparted across pretty much any surface you care to describe, completely belies this approach. so much so, in fact, that there is the faint notion of not going anywhere very fast. compared to throwing a carbon bike around hills, downhills and corners, the milani feels very safe and verging on the wrong side of sluggish. the reality, however, is quite different; this bike moves every bit as quick, and has a manouevrability that is several magnitudes of brilliant greater than my bike handling abilities. this softness was a bit disconcerting at first, but riding in company of those who like to reach sprint speeds towards debbie's on a sunday, there was little trouble keeping up, or even forging ahead, all the while feeling as if i was just out for a sunday ride. however, the real test is how easily or otherwise it manages to defy gravity. despite being rather thin where it needs to be, the acciaio isn't the lightest frame i've ever ridden, yet hill-climbing is another arrow to its bow. the all-important follow through at the bottom of each pedal stroke is definitely there, but not in the quantity i'd rather expected, however, it would appear that, despite appearances, every feeble watt of power is directed towards making the bicycle go forward and up. to resurrect a rather cliched observation, it rides a lot lighter than it is. and that, basically is the problem, even if that problem is one you'd really rather possess; the xcr tubing behaves like the apple macintosh operating system. it does all the hard work, does it very well indeed, but presents the rider with an uncanny smoothness that all but hides the fact that there's anything much going on at all. not being one who races, i know not whether this is a feature that will be loved by those who do, but i can assure you it is a feature that takes very little time to fall in love with. if support for this were needed, i set out to ride around 60km during this past week, mainly to acquire more photos for the review, and came home having covered just under 95km. i was having fun. though it would have been lovely to ride this machine with a pair of xcr forks as opposed to the carbon ultras provided, i do not in all honesty, have grounds for complaint. their tracking was excellent, damping qualities just ginger peachy, and they really didn't detract in any way from the look of the steel frame. i understand milani's desire to show off the outer attraction of stainless steel, but i'm afraid that's the one part of the bicycle that left me cold. there have been one or two stainless frames that adopt an aesthetic similar to that of titanium, offering a more satin finish which is rather attractive. the bare steel and that dreadful paint scheme (which was negatively commented on by more than just me) simply do not do justice to the material and workmanship, if i were milani, i'd think again. 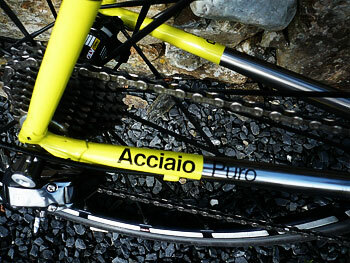 though my review is principally concerned with the ride quality of the acciaio puro, in order to get there, several other bits were needed to help. the sram force gearing and braking are almost the equal of their big red brother, and more than up to parity with the quality of the frame. in my role as groupset whisperer, i figure the milani would have been better equipped with a campagnolo groupset, but that is in no way a demeaning of that fitted; it's just the way that it is. the wheels were not as intended, but having ridden and reviewed the mavics previously, i could at least account for their performance in relation to the ride of the bicycle as a whole. 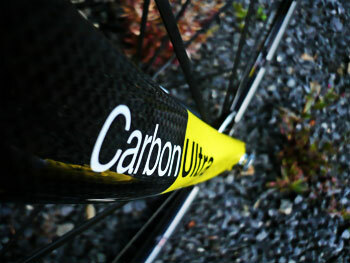 they gave no problems whatsoever, and if nothing else confirmed why they are one of cycling's finer wheelsets. what did turn out to be a surprise, and a very welcome one at that, was the comfort provided by the san marco regal saddle. with so many revolutions in saddle design and construction over the last few years, it is of note that a more traditional shape, very much at variance with fashion, should provide such great comfort over lengthy distances. if i'd realised this, i'd have bought one of these years ago. 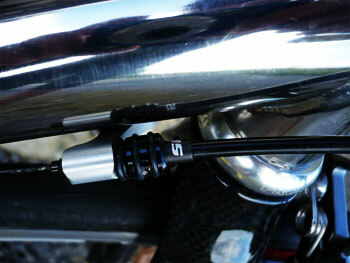 the regal's carbon rails were clamped to the rest of the bike by the double bolt (fore and aft) system of the 3t carbon seatpost, and here was likely the only misfiring of the whole setup (excluding the errant wheels). though i was careful to check that both bolts were tight at the start of the review, both came loose on two separate occasions. in one case, on returning home, the entire saddle could be slid easily back and forth on its rails. it may simply be a rogue model, or perhaps i was remiss in my setup technique, but i'm inclined to think not. there seems little wrong with a one bolt seatpost; if it ain't broke, don't fix it. perhaps the racing pedigree of the milani should have been apparent from the start, arriving as it did with a 53/39 chainset. many nowadays have opted for the compact, perhaps geared more (if you'll excuse the pun) for the sportive rider, a cloak that most of us nowadays wear, even if it doesn't fit. 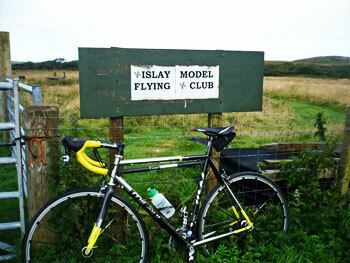 islay has few if any lengthy climbs, and to be honest, 53/39 is fine by me, but i dare say you could specify a compact if that was more suited to your purposes. i'm feeling slightly guilty that the bulk of the above seems to weight heavily on the negative side, for in fact this is probably one of the best all-round and most comfortable bicycles on the market today. the combination of of milani's know-how and columbus' tubing expertise has produced a bicycle that is considerably greater than the sum of its parts. considering the state of the roads these days (and not just here) the columbus steel ironed out a huge proportion of the rattle and hum, making it far easier to ride further than intended without tiring. though milani seem keen to aim this at the racing cyclist, a gran fondo or sportive would seem more its forte. an outstanding machine which would be even better if they painted it.